Chris Burt ’83 was drawn to the UW in 1973 by its world-renowned meteorology department. Although he’d been studiously recording the weather since age six, at UW–Madison, his scholastic dreams stalled against the rigors of meteorological math. So he left school for a brief stint in farming and then toured Asia. Smitten by Thailand, he reenrolled at the UW in 1979 to earn a degree in international relations. After graduation, he entered the travel guide business in Bangkok just as Thailand became a popular tourist destination. Burt jumped into the U.S. market with the Compass American guidebook series and sold that venture to Random House in 1992. 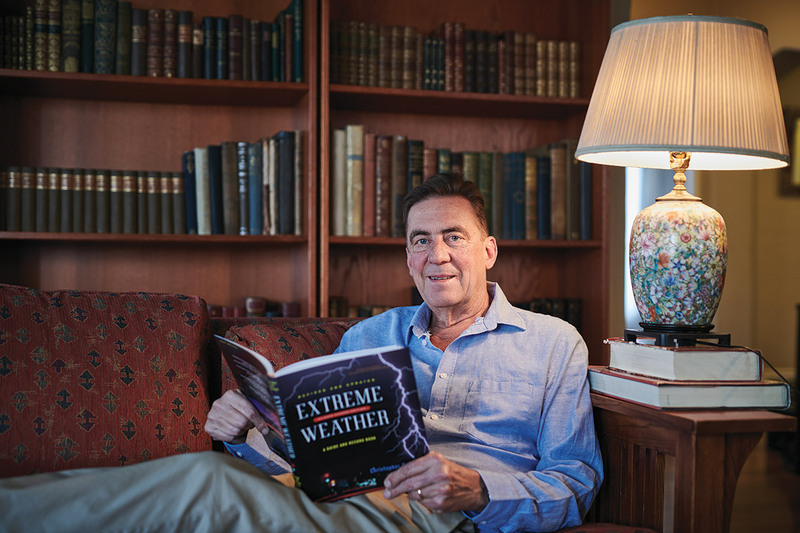 He moved to the Bay Area and remained as publisher until 2001, when he reconnected to his weather enthusiasms. Burt created an extreme weather guide, working from a photocopied 1971 compendium of record-breaking weather compiled by one of his mentors. He updated the data and packaged it as Extreme Weather: A Guide and Record Book . The book helped launch him from meteorological dropout to a blogger at Weather Underground, a popular website for weather junkies. One of his blog posts even led to the World Meteorological Organization (WMO) overturning a 90-year-old statistic of the hottest temperature ever measured on Earth (136°F at El Azizia, Libya, in September 1922). Burt’s investigation found critical flaws in how the heat was measured, prompting the WMO to conduct its own investigation and confirm his findings. The record fell by default to the 134°F observed in Death Valley, California, on July 10, 1913. The upset led to national media coverage and landed Burt an ad hoc membership on the WMO’s World Weather and Climate Extremes Committee. Madison-area lake levels continued to rise after a record-breaking storm on August 20, 2018, dumped more than 10 inches of rain on parts of Dane County and caused flooding on the UW–Madison campus lakeshore. Street closures in the downtown area also complicated matters for students who moved into residence halls six days later. While other areas of Madison experienced flooding for weeks after the initial rainfall, campus remained open for normal operations. Before Irma turned into a Category 5 hurricane, UW–Madison’s Tropical Cyclone Research Group was the first to spot the then tropical storm off the coast of Africa. The UW scientists share such findings with National Hurricane Center forecasters, who then release warnings to the public. “You have to take a little pride in being a small slice of the process that lets people know what will happen — so they can get out of the way,” senior scientist Chris Velden MS’82 told the Milwaukee Journal Sentinel . “Meteorologists are drooling.” That was the report from the Washington Post when the GOES–16 satellite sent back its first images of Earth in January. From wispy swirls of white against a deep blue expanse, to bold-hued panels of North America, to plumes of smoke from wildfires, the images offer views never seen before and — for the first time in decades — views of Earth at night and in true color during the day. GOES stands for geostationary operational environmental satellite, and this is the 16th in the GOES series, the first of which launched in 1975. 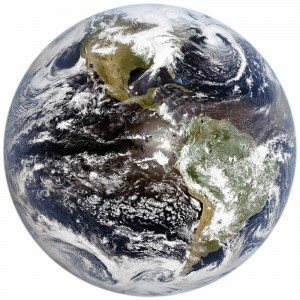 The satellite offers three times more imaging capability, four times more spatial resolution, and five times more coverage than previous GOES satellites, says Tim Schmit ’85, MS’87, a National Oceanic and Atmospheric Administration (NOAA) scientist based at UW–Madison. Schmit and colleagues at the UW’s Space Science and Engineering Center, the Cooperative Center for Meteorological Satellite Studies, and NOAA’s National Environmental Satellite, Data, and Information Service began preparing for GOES–16 in the late 1990s. From his Twitter handle, @GOESguy, Schmit has enjoyed watching social media users wonder over the satellite’s capabilities and learn how to use its data. In addition to stunning images, the satellite offers improved hurricane forecasting, aviation-route planning, and wildfire tracking. This image of Sandy was taken by one of NOAA’s Geostationary Operational Environmental Satellites on October 29, as the storm neared the coast of New York and New Jersey. 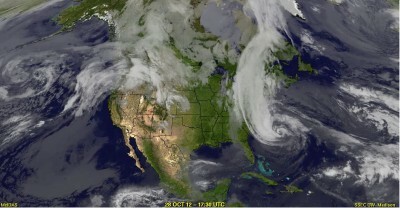 A time-lapse view of the storm’s development can be viewed online. Courtesy of UW-SSEC Data Center. 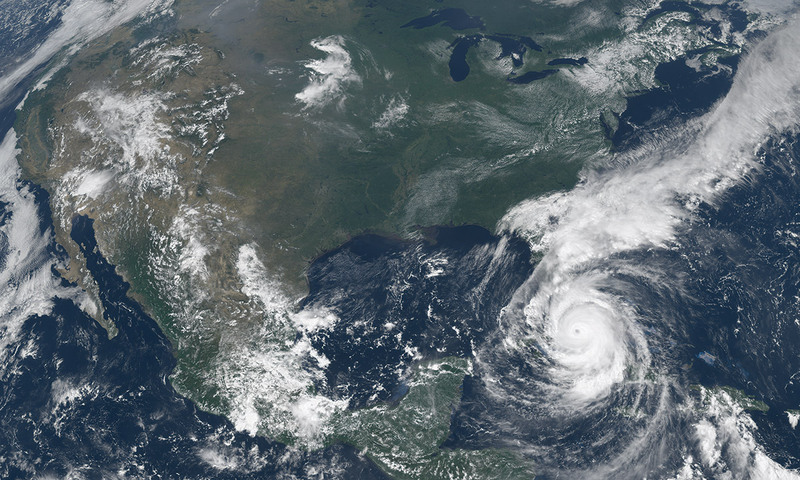 Last October, as Superstorm Sandy bore down on the coast of New York and New Jersey, national weather services relied on the UW’s Space Science and Engineering Center (SSEC) to get the satellite data that would help them analyze the storm’s behavior. Because meteorologists expected the storm to be so severe, SSEC asked the National Oceanic and Atmospheric Administration (NOAA) to activate an offline satellite to follow Sandy exclusively, and send back minute-by-minute images. The result was an unprecedented dataset of a single storm’s lifecycle. SSEC hosts the Cooperative Institute for Meteorological Satellite Studies (CIMSS), formed in partnership among the UW, NASA, and NOAA. CIMSS scientists conduct meteorological research using images and information from satellites. “Minutes after a satellite picture is taken, it’s downloaded at SSEC and made available to the scientists here,” Velden says. The CIMSS team is then able to process the images into products that can help forecasters better predict what storm systems will do — such as charting the path that Sandy took out into the North Atlantic, and then back onto the shores of New York and New Jersey. Sandy also provided an opportunity to show what the satellites of the future will be able to do. Velden says the next generation of satellites — scheduled to launch in the next two to three years — will be able to routinely transmit such images at any time. This will enable meteorologists to home in on the factors that shape and direct severe weather systems, making forecasts more accurate. Blizzards are bad. Hurricanes are worse. But when it comes to killing power, no weather packs the punch of a heat wave, according to the numbers that Richard Keller has crunched. Keller, an associate professor in the School of Medicine and Public Health, has been counting the dead from the heat wave that struck France in August 2003. That month, high temperatures in Paris climbed above 100 degrees Fahrenheit, with lows in the eighties. During that stretch, the nation saw its mortality rate shoot up by nearly 15,000 deaths. Accurate numbers are difficult to get in modern times, as well, Keller notes. When some natural disasters hit, the death toll is fairly easy to count: bodies drowned in a flood, for instance, or crushed by falling buildings in an earthquake. But heat is a more insidious killer. Keller used numbers that French demographers came up with to measure excess deaths — that is, the total number of people who died in France in August 2003, as compared to the average number of deaths in the same month in 2000, 2001, and 2002. The result was an increase of 14,802. “It’s a crude measurement, extremely blunt,” he says, but it’s the best overall calculation. Across Europe, the heat wave may have accounted for 70,000 excess deaths. It wasn’t the daytime highs that seemed to be most deadly, Keller believes, but rather the low temperatures — which were actually very high, meaning that people who suffered all day found no relief at night. Today, France — as well as communities across the United States and elsewhere — pay greater attention to the danger of heat waves, mandating air conditioning in nursing homes and senior living facilities, and setting up “cooling centers” where the public can have access to air-conditioning. But Keller notes that such measures may have little effect.